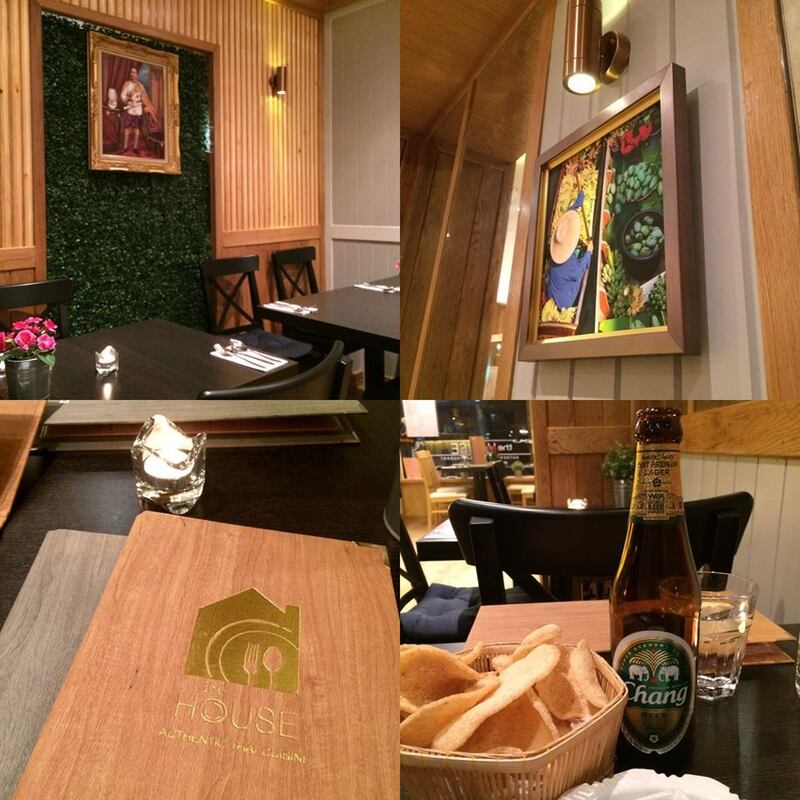 The House is the latest Thai restaurant to open in Cambridge. 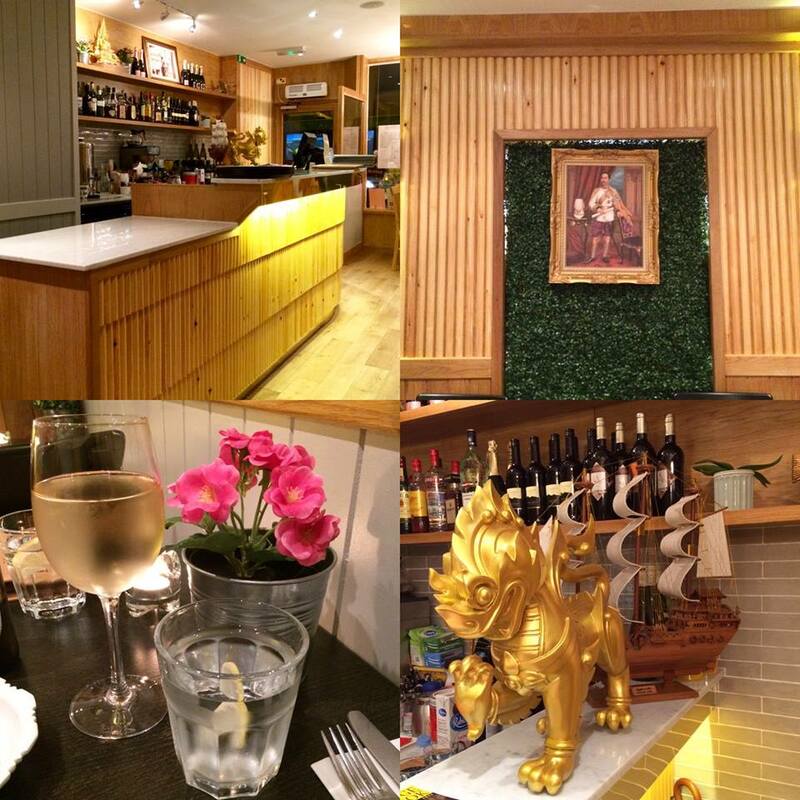 Described as an authentic Thai restaurant, this is The House’s second location, the first being in Norwich. 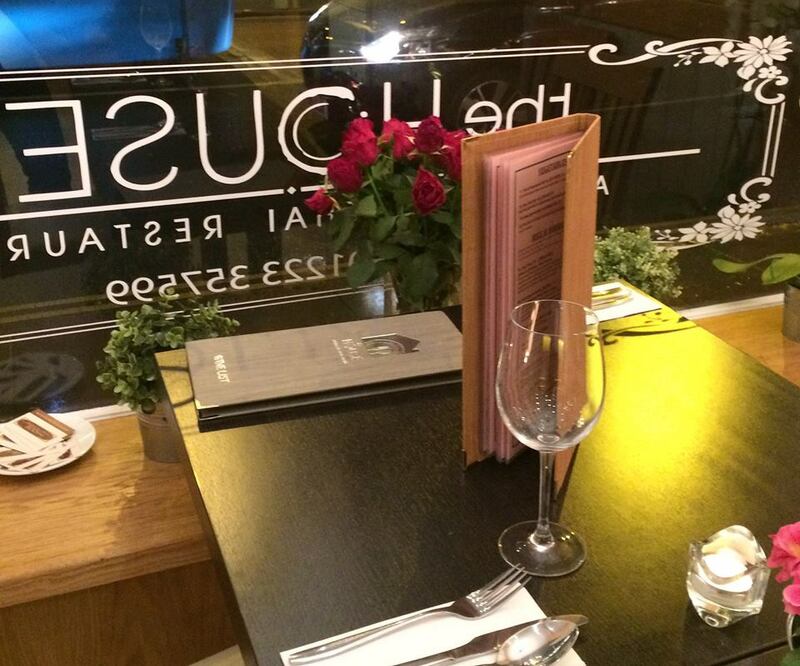 Its location on Cambridge’s busy Regent Street is ideal and we popped in to check out the food for ourselves. We arrived shortly after they opened for dinner at 5:30pm (they close between 3pm and 5:30pm) so we were able to get a table without having to wait. The place filled up quickly afterwards. We received a warm and friendly greeting and were shown to our table and given the food and drinks menu. 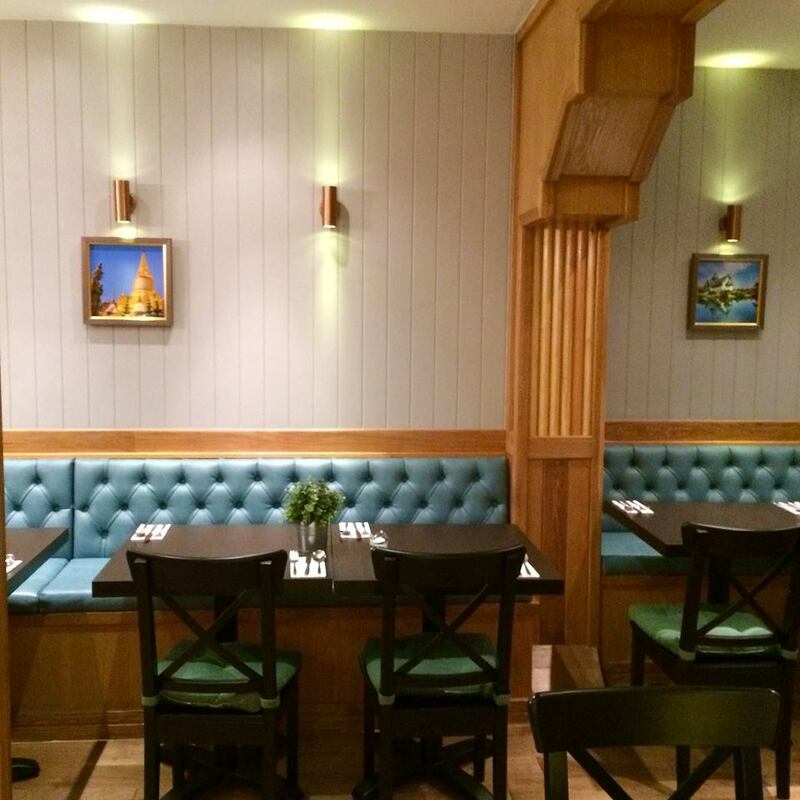 The restaurant is bright, cheerful and nicely decorated. The décor is inspired by the colours of bamboo, with simple but colourful paintings hanging on light grey walls. Off the main entrance there is another room with additional seating featuring light blue padded benches along the wall. I think this is a nicer area to be seated, especially for groups of 4 or more. However, that area wasn’t available at the time we arrived. We were seated in the main area by the bar at a table for 2 with a slightly odd layout as the chairs did not face each other. One of the chairs faced the wall but they made up for this with mirrors so it felt spacious. We soon got used to the odd seating and made ourselves comfortable. Service was always with a big smile… and prompt too. We ordered our drinks: Chang beer for Paulo and a glass of Robinia Pinot Grigio for me, which was a good match for spicy food. I liked that wine could be ordered by the glass and in three different options – 125ml, 175ml and 250ml. Guess which size I ordered? That’s right, go large or go home! 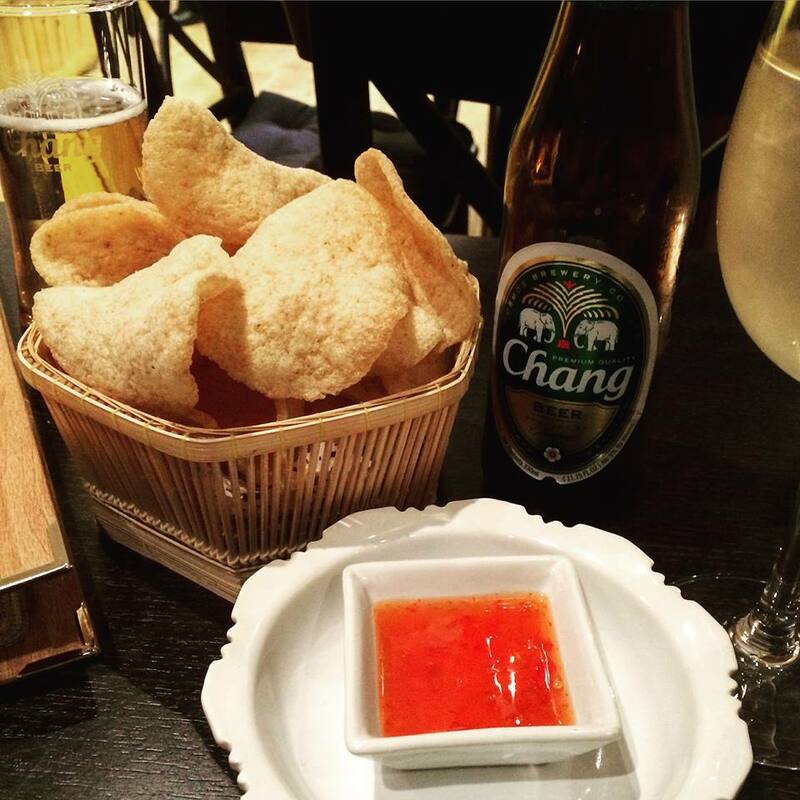 We asked for some prawn crackers and they were fresh and crispy (I hate heavy, stale ones). They were served with sweet chilli sauce. A good start! All of the starters on the menu sounded very appetising and I’ll be sure to return and try some more. 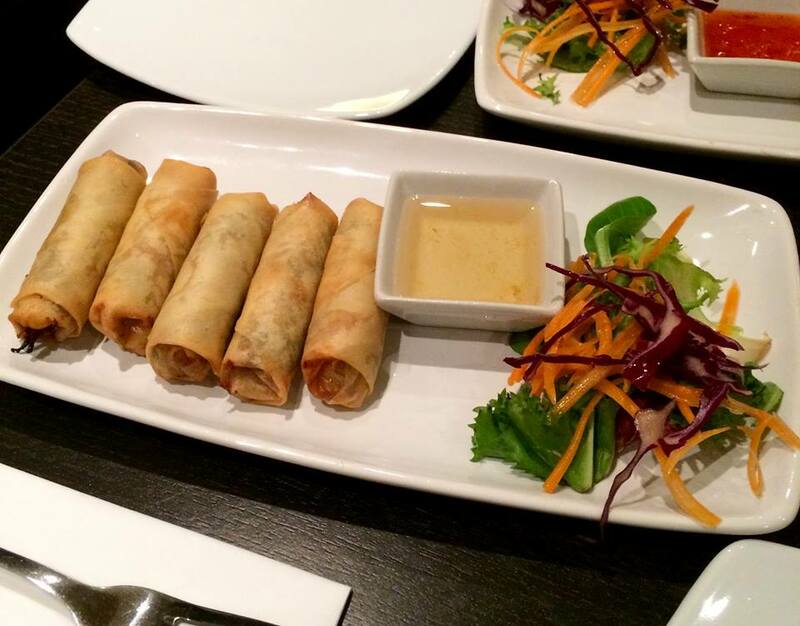 I’ve got my eye (and taste buds) on the Golden Parcels (Tung Tong), a dish featuring chicken and vegetables marinated in an aromatic herb blend wrapped in crispy rice pastry and served with sweet chilli sauce. 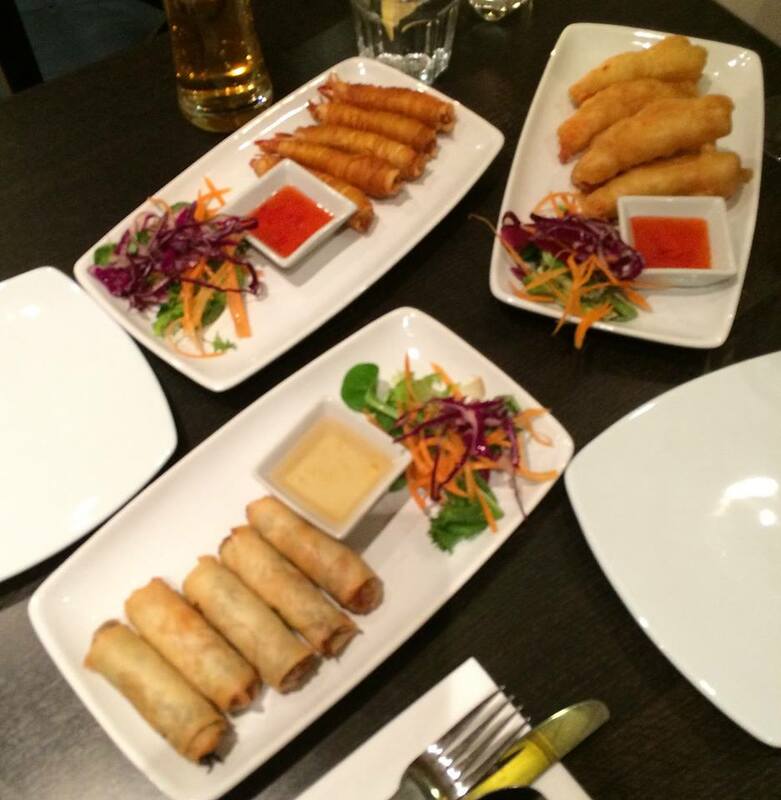 On this occasion we shared some tempura and spring rolls. The Prawn Tempura was deep fried in the chef’s own recipe batter, which was light and crispy. 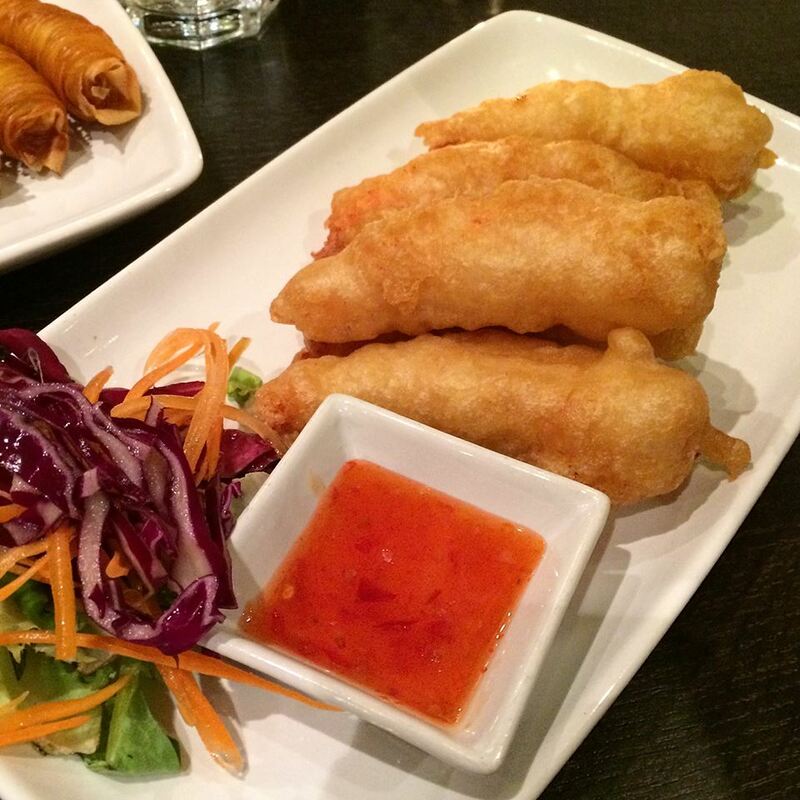 It was served with sweet chilli sauce. 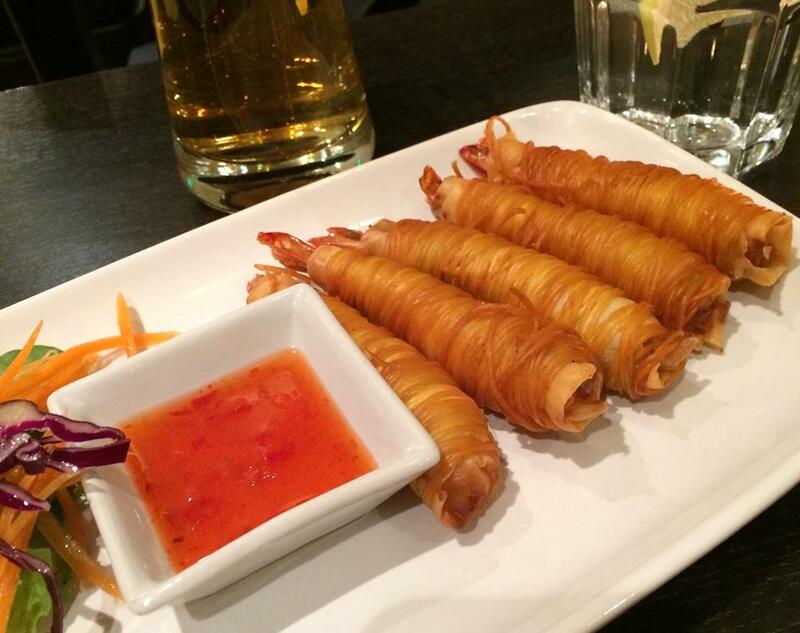 The Prawn Spring Rolls (Goong Pán Mee) were wrapped in egg noodles so they looked quite appealing. They were moreish and deliciously crispy. The same sweet chilli sauce was the accompaniment. 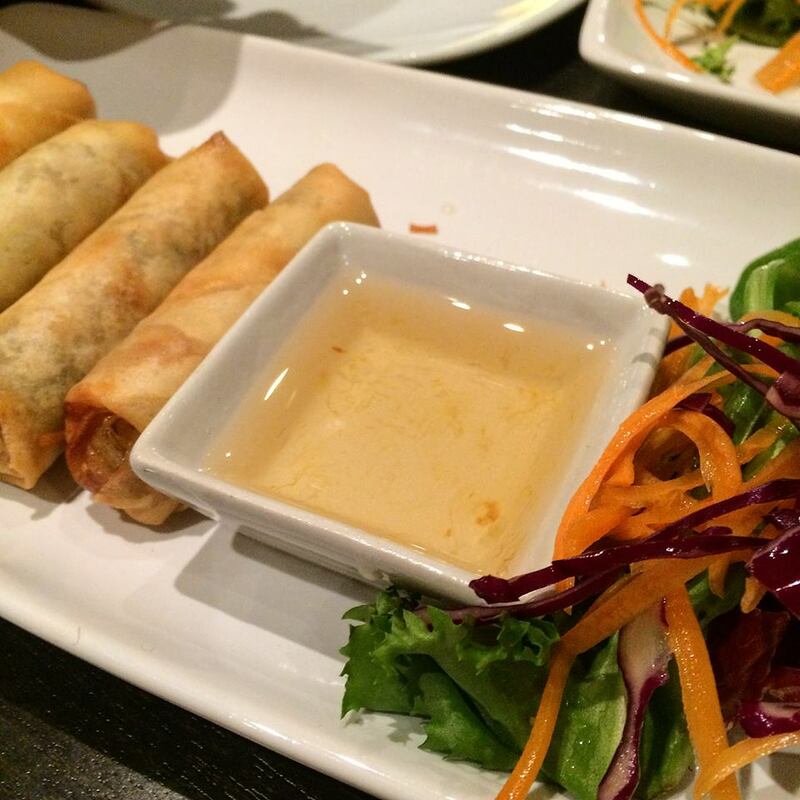 The Vegetable Spring Rolls (Poh Pia Tod) were some of the best I’ve had. The rice pastry was crispy and not the least bit greasy. The filling, a selection of stir fried vegetables and vermicelli, was very tasty and complemented the accompanying sweet plum sauce. 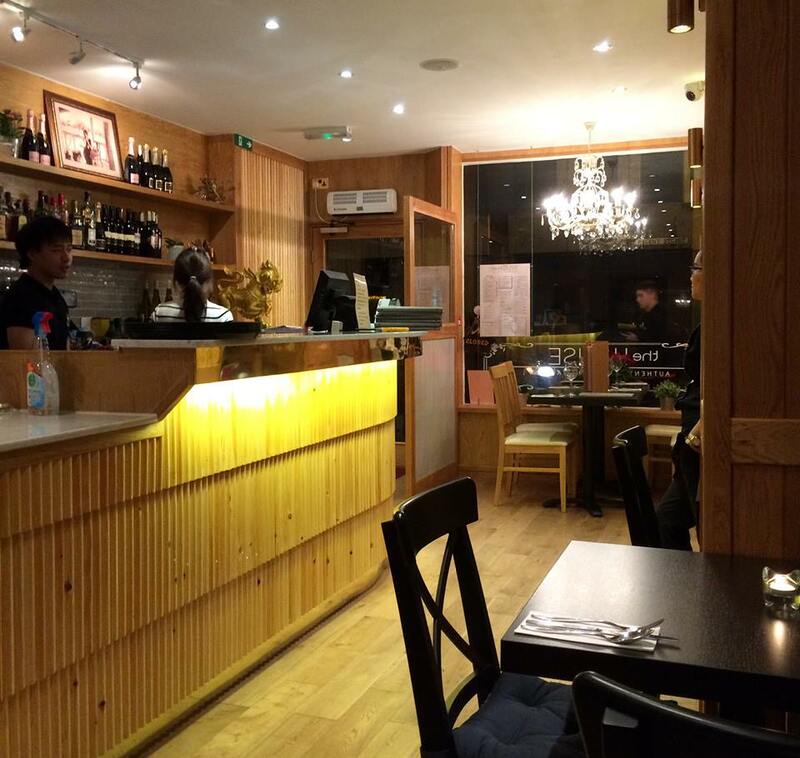 The mains include a good selection of dishes… soups, salads, curries, seafood, pan fried dishes, stir fried vegetables and rice & noodles. I stuck with my favourite, Pad Thai, and besides, the ultimate test of a good Thai restaurant for me is their Pad Thai so I wanted to try this out. I was not disappointed. I chose prawns and I was glad I did because they were big, juicy and high quality. The rice noodles were stir fried with egg, bean sprouts, spring onions, ground peanuts and julienned red chilli peppers. The menu states that the chef has a unique secret recipe. I definitely agree as the flavours were really vibrant. 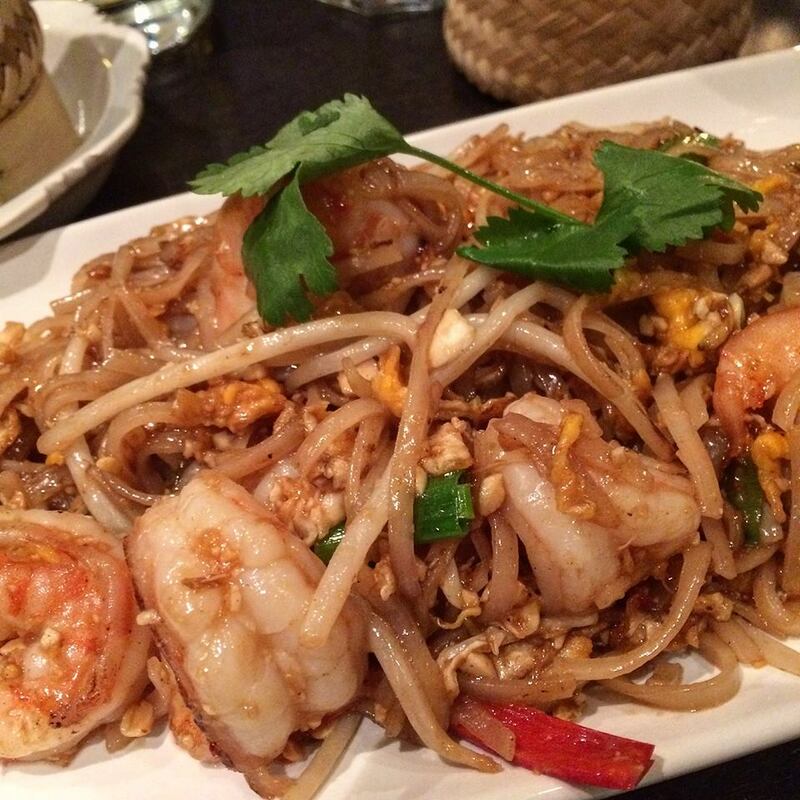 So many times I’ve been disappointed by bland Pad Thai with gloopy noodles… not the case here! Paulo, the spice fiend, ordered the Jungle Curry (Geng Par) with prawns. I didn’t taste it but a quick sniff of its delicious aroma indicated it was spicy indeed! 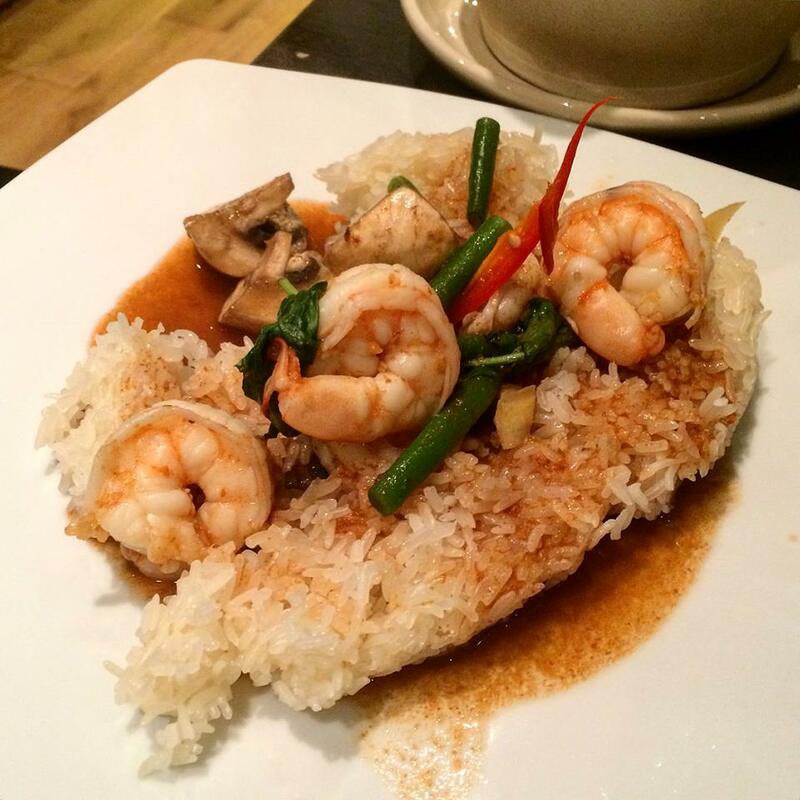 It featured the same high quality prawns in a spicy, clear Thai curry with fine beans, sliced bamboo shoots and mushrooms, with lime leaves as the garnish. The curry was presented in a ceramic pot with lid over a stand with a tealight nestled inside. 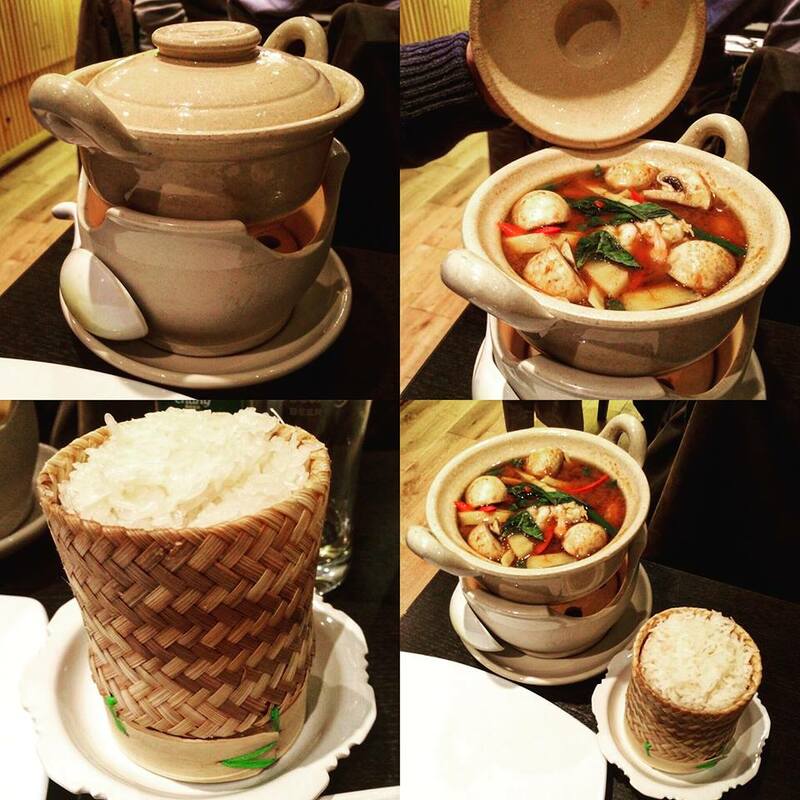 To accompany the curry, Paulo chose the steamed sticky rice, which was served in a woven bamboo basket. 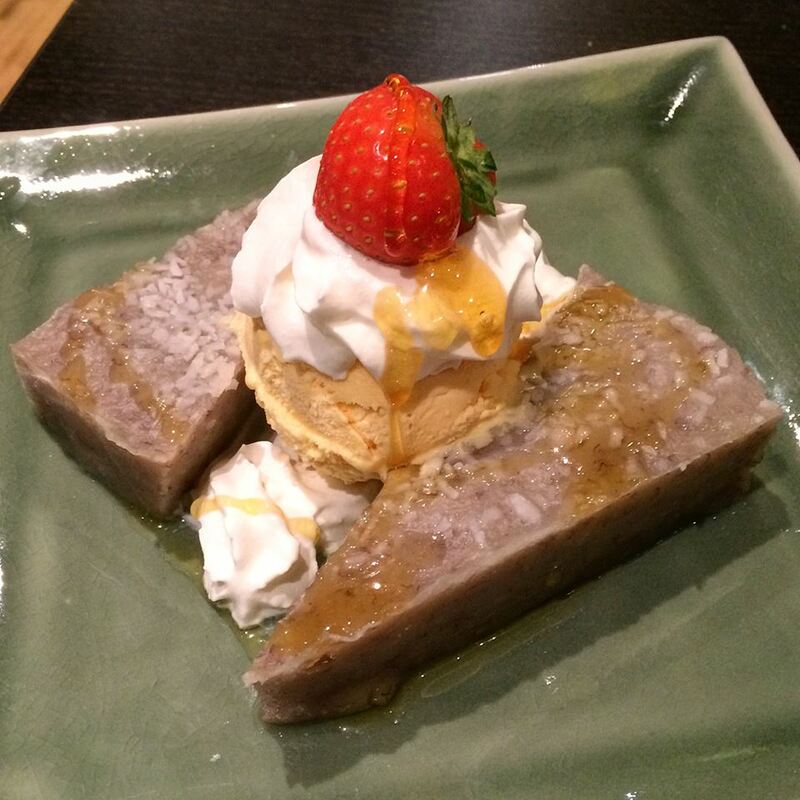 I never have desserts at Thai restaurants, mainly because I’ve found them to be rather generic. Nevertheless, we had a look at the menu out of curiosity. The descriptions of the traditional Thai desserts caught our eye. Our waitress cleverly whipped out an iPad and showed us photos of the options, which are all freshly made on the premises. They looked even more tantalising than the descriptions… we were sold! 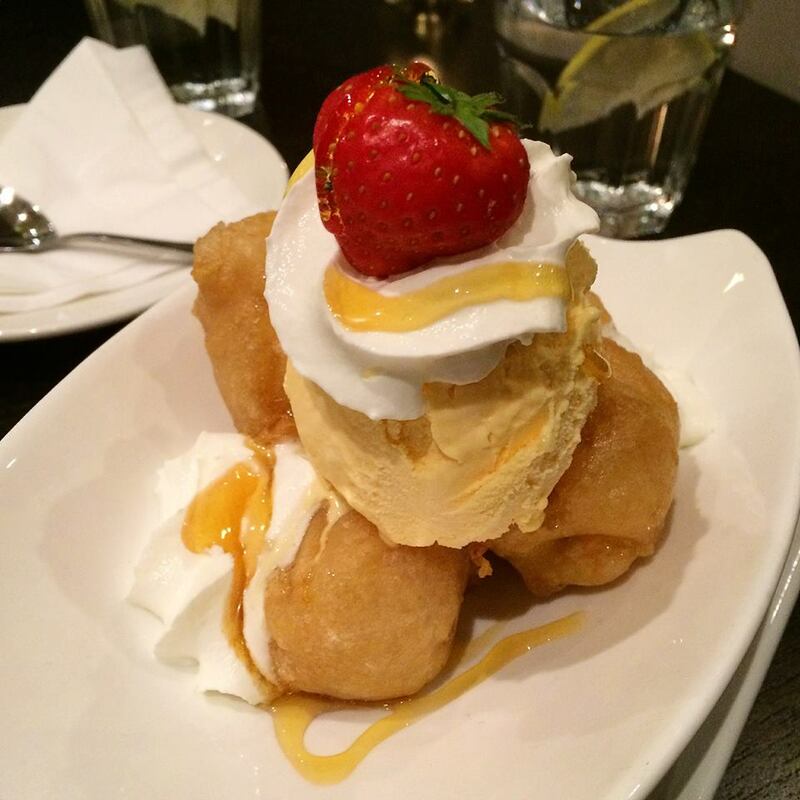 I ordered the banana fritters with ice cream, cream and a strawberry on top. I could tell the fritters were freshly made, not frozen and plonked into a deep fryer. The bananas were perfectly ripe too. Paulo had the steamed banana cake, which was of a jelly-like consistency. It was sweet and slightly creamy. Our waitress explained that in Thailand the mixture is wrapped in banana leaves then steamed but it’s not possible to do that here. Either way, it was delicious. I have to say the desserts come in big portions… we could have easily shared one and still be full. So do leave room for dessert or share, as we thought the traditional Thai desserts were really quite good! 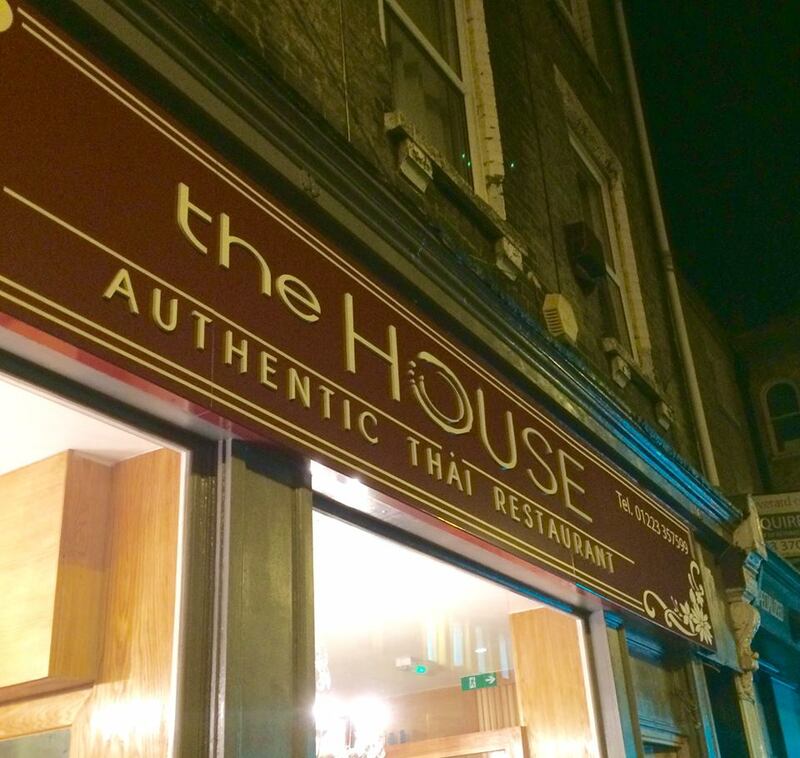 Things to note: The House offer a 10% discount on takeaway and delivery orders. There is a minimum spend for the discount and a delivery charge for orders outside a 2 mile radius, so check their terms and conditions before ordering. They are open 7 days a week, starting at 11am for lunch. They are closed between 3pm and 5:30pm, then open again for dinner until 10pm (10:30pm Fridays and Saturdays). 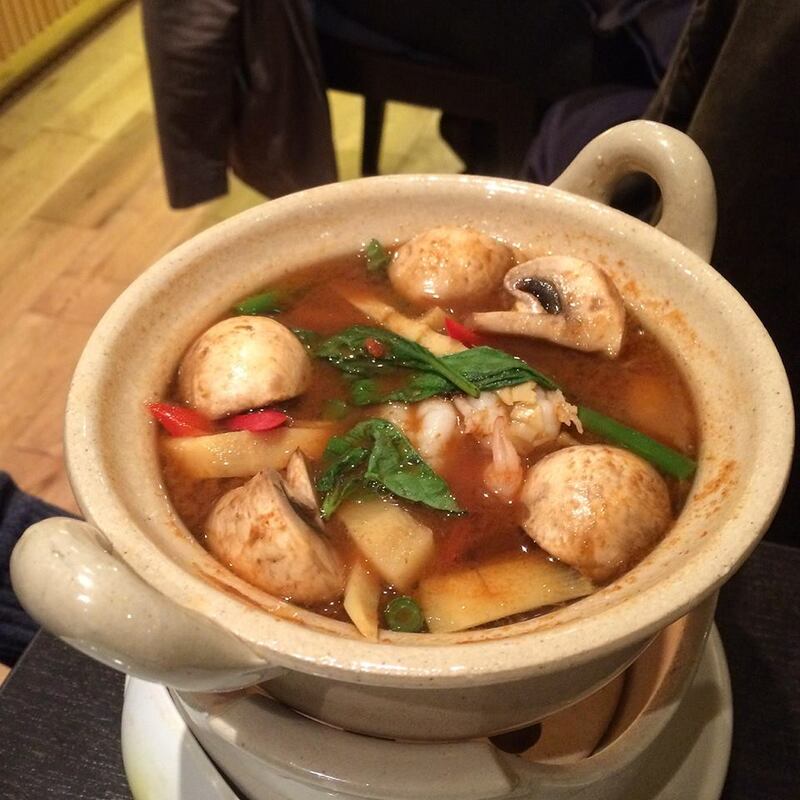 We will definitely be popping into The House again the next time we fancy some good Thai food in Cambridge city centre. 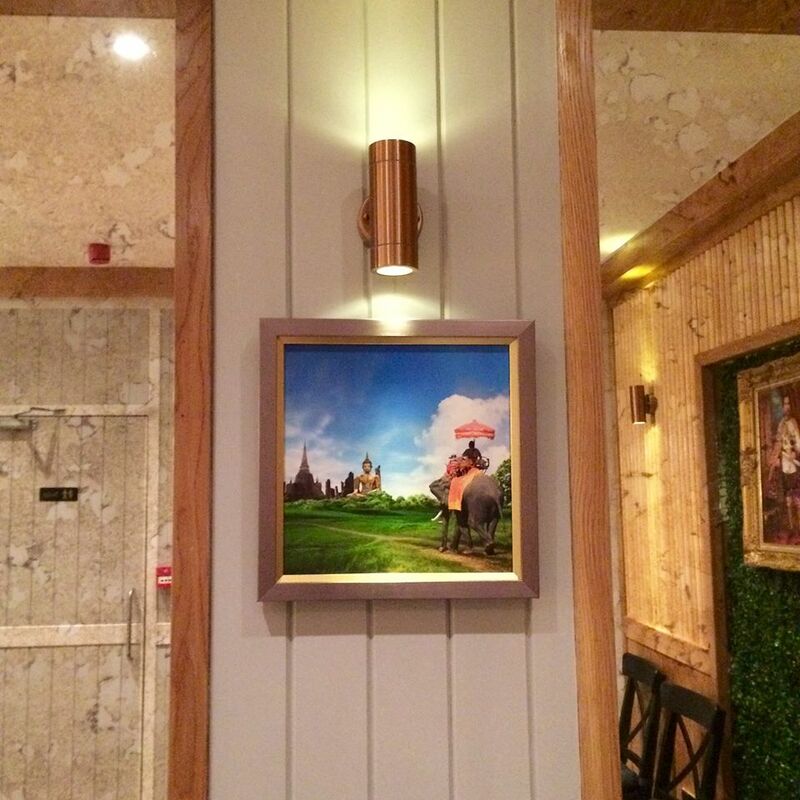 This entry was posted in Restaurants and tagged authentic thai restaurant, banana fritters, Cambridge, cuisine, Jungle Curry, pad thai, steamed banana cake, The House by One Two Culinary Stew. Bookmark the permalink.